Finally we can be sure — black holes, those gravitational monsters that gobble up everything that gets too close to them, do exist. The crucial piece of evidence arrived yesterday, when physicists announced they had detected ripples in spacetime called gravitational waves for the first time. "It's the greatest discovery in experimental gravitational physics of the last hundred years," says Pau Figueras, a theoretical physicist as the University of Cambridge. "It provides a direct detection (and hence confirms) two inevitable consequences of [Einstein's theory of gravity]: gravitational waves and black holes." According to Einstein's general theory of relativity, spacetime is more than a rigid stage on which the physics of the Universe plays out: it actually gets involved in the action. Massive bodies, such as planets and stars, can warp the very fabric of spacetime, just like a heavy object placed on a mattress warps the mattress. Gravity, which we perceive as a force, is a result of the curvature of space and time. A massive body like the Sun creates a dip in spacetime, thus diverting the path, and apparently attracting, less massive bodies like the Earth. Black holes arise when the curvature of spacetime becomes extreme (for example when a very massive star collapses to occupy a very small region of space). Gravity then becomes so strong that nothing, not even light, can escape from the region. Hence the name "black hole". All that's according to theory, but until yesterday direct evidence for the existence of black holes was still missing. Physicists believed they exist, but they couldn't be sure. 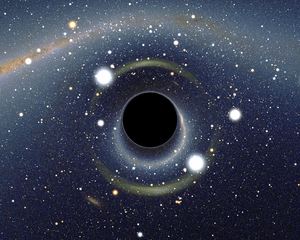 It's impossible to actually see black holes (after all, they are black) but one way of detecting them is to observe the effect they have on spacetime. Just as a massive object moving around in a pond will create ripples in the water, so a massive object, like a black hole, moving around in spacetime will create ripples too. These gravitationally waves are particularly strong when they come from two black holes that spiral around each other, get closer and closer, and eventually merge. Einstein's theory allows you to calculate exactly what the gravitational waves created by such a black hole merger should look like. And the gravitational waves detected by LIGO exactly match the profile: they look exactly like waves coming from black holes that collided over one billion lightyears away from Earth. The detection therefore counts as further evidence that Einstein's theory is correct, and as the first direct evidence for the existence of black holes. To find out more, see Mysterious black holes which includes a video interview with Pau Figueras.